preached at Christ Church, South Yarra, in our local ecumenical celebration of the Feast of the Ascension. St. Augustine considered the Feast of the Ascension to be the crown of all Christian festivals, but nowadays we’re often not quite sure what to do with it. We no longer think of heaven as a geographical place just north of the sky, so we’re a bit embarrassed by the clunky literalism of icons that show Jesus’s sandals poking out from the bottom of a cloud as he disappears from sight like a lost helium balloon. But even when we try to move on beyond such literalism, we often end up with what sounds like a doctrine of the real absence of Christ. A bit like having your parish priest suddenly elected bishop of some remote diocese, now you see him, now you don’t (Explanatory note: It was just announced last Sunday that Fr Richard Treloar, the parish priest of Christ Church and presider at this service, has been elected Bishop of Gippsland). Christ is risen, but he’s now somewhere else. 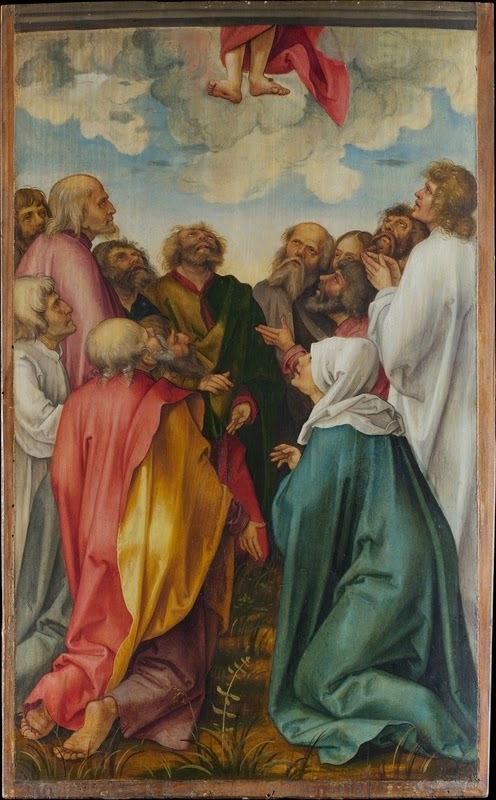 With all four gospels seeming to have trouble working out how to finish their stories, and Luke being the only one that describes an ascension, it can seem like just an awkward literary device to close the story, although the fact that Luke tells it again as the beginning of the sequel in Acts makes that seem unlikely. But we struggle to see what value the ascension adds to our understanding of God or the Bible or to our endeavours to faithfully follow Jesus. It’s a bit hard to follow someone who shoots off through the clouds, whether literally or metaphorically! I think our problem is that we’ve tried to understand the ascension as either history or literature, when in fact we need to experience it as liturgy. If we can reclaim it as liturgy, we might again be able to see this Feast as the crown of Christian festivals for reasons more substantial than just that in our local cycle of ecumenical worship, the host church for this feast has the most impressive choir and the greatest likelihood of someone disappearing into a cloud … of incense. There is a lot of talk in the gospels about Jesus fulfilling ancient biblical prophesies, and to the Biblical authors, that included Jesus fulfilling the intended meanings of the ancient temple liturgies. The temple of Jesus’s day, the second temple, was not only widely seen as corrupt, but was regarded as a mere shadow of the first temple, in both its architecture and its function. Part of the deep messianic expectation was the yearning for the arrival of God’s anointed true high priest who would restore and fulfil the life-giving ancient liturgies. Without much knowledge of the ancient liturgies, we miss most of the allusions that the New Testament writers make to them. We are probably aware that the death of Jesus was seen as somehow fulfilling the sacrificial liturgies of either or both of Passover and the Day of Atonement, but our reading of those is usually distorted by a greater familiarity with the sacrificial practices of the ancient Aztecs than the ancient Israelites. As a result, many of us, me included, have become very wary of talking about the death of Jesus as a sacrifice. That discomfort was thrust into sharp relief a couple of weeks ago with the news that archaeologists in northern Peru had uncovered evidence of what may be the world’s largest single case of child sacrifice. They found the carefully arranged remains of 140 children and 200 llamas, all of whom appear to have been ritually slaughtered in a single day about 550 years ago. It appears that this horrifying sacrifice was a response to terrible floods that were ravaging the country. In all probability, they had already sacrificed some adults in an attempt to appease the anger of the gods and stop the floods, but when that didn’t work, they felt they had no choice but to offer sacrifices of greater value, and what could be of greater value than their own children and their only beasts of burden. If stories like that shape our understanding of the sacrifice of Jesus, then he becomes the innocent child offered to appease an angry God who if not satisfied will go on punishing us for eternity. That is indeed how many many Christians imagine the gospel. And yet if that were truly the story, then the only difference between the Christian gospel and that ancient sacrificial cult in Peru would be the claim that we have an even higher value sacrifice. But in fact, the ancient Day of Atonement liturgy understood sacrifice in almost the exact opposite way. In the liturgy of Solomon’s temple the High Priest did not sacrifice anything to God. He symbolically enacted the self-offering of God to the people. The priest took the first lamb or goat into the Holy of Holies, not to sacrifice it to God. In fact, that first lamb was called “the Lord”, and when the priest sacrificed it in front of the mercy seat between the two angels, the priest took on the name of the Lord. Then, wearing a seamless white robe and the unpronounceable name of the Lord on his head, the priest would emerge from the Holy of Holies as the embodiment of the Lord, sprinkling the blood of the lamb which is the blood of the Lord over the people and everything else in sight. Thus was atonement made for the sins of the people, not by sating an angry God with blood, but by an infinitely loving and gracious God sacrificing God’s own self and spilling God’s own blood in a generous act of forgiveness. What we, the people, are set free from is not God’s anger, but our own self-inflicted enmeshment in vicious cycles of retribution and hatred that constantly threaten to destroy us all. You can see that at the heart of this liturgy, there is a human being standing in for God; a human being who takes on the role of God in the liturgy, offering himself to the people to bring forgiveness and peace. And with atonement made, that human priest returns to the Holy of Holies, to the mercy seat between the two angels where no one else may go. Symbolically he is going back through the veil and into the throne room of heaven. And we caught a glimpse of this in our reading from the prophet Daniel, where we heard the vision of the Human one entering the throne room and taking up his seat at the right hand of God. That vision comes straight from the conclusion of the liturgy. Now what does this have to do with Jesus and his ascension? Well, in an atmosphere of intense longing for the appearance of a true high priest who would properly atone for the sins of the people, Jesus appears enacting and fulfilling these prophetic ancient rites. Coming from the Holy of Holies, he emerges through the veil of creation wearing the holy name of the Lord, “I am”, “I am”, the human embodiment of the great “I am”. He comes to the people, not to demand a victim to be sacrificed to an angry God, but to offer himself to the people as their victim, spilling his own blood to reveal the overflowing self-giving love and forgiveness of the great “I am”. He shows God to be the generous initiator of a forgiveness that we can never purchase or achieve, but can only be given through the cosmic liturgy by the one who first voluntarily becomes the victim of all that we need to be forgiven for. And remember that mercy seat in the Holy of Holies with its angels either side? Well what does Luke tell us the women found in the empty tomb? Two angels and an empty space in between. The tomb has become the Holy of Holies, complete with the mercy seat and its angels. And who now turns up at the ascension, as the disciples stare after their ascending high priest? Yep. Those same two angels. Which tells us that in this ultimate fulfilment of the prophetic liturgy, the ending has a new expanded meaning. No longer are those angels confined to a Holy of Holies where only one high priest may go. The veil has been torn open and the mercy seat between the angels is now everywhere. That’s why this table is rightly now placed here in our midst rather than back there behind the screen. In the resurrection and ascension of Jesus, the Holy of Holies has been opened up to all the earth. And this new openness is in both directions. Each time we reenact this liturgy again in our celebration of the Eucharist, no longer are we just trying to invoke God to come out from behind the veil and become truly present here on earth. Now we are equally being gathered into the body of Christ as he ascends into the throne room of heaven. That vision in Daniel was then a novelty, a human being bodily entering heaven, but now Jesus bids us all follow him in as the veil is removed and the marriage of heaven and earth is consummated. But having been gathered into the body of our great High Priest who goes into the Holy of Holies, we, like him, go in to emerge again, sealed with the holy name of God and offering ourselves for the life of the world. All of us are now part of this priestly service of the world. In my Baptist tradition, we have often mistakenly thought of this as the priesthood of each believer, but this shared priesthood is not an individual thing. It is the priesthood of all believers, collectively. It is together as the body of Christ that the angels now urge us to take up this priestly service of the world. In a violent and vengeful world that still mostly responds to every crisis by demanding that a price be paid for every offence, an eye for an eye, this priestly service is a risky endeavour. Jesus has shown us that death is not nearly as terrifyingly fatal as we had imagined, but standing in for the God who willingly becomes the victim of the world’s lust for retribution, armed only with forgiveness and love, is seldom a safe and comfortable vocation. 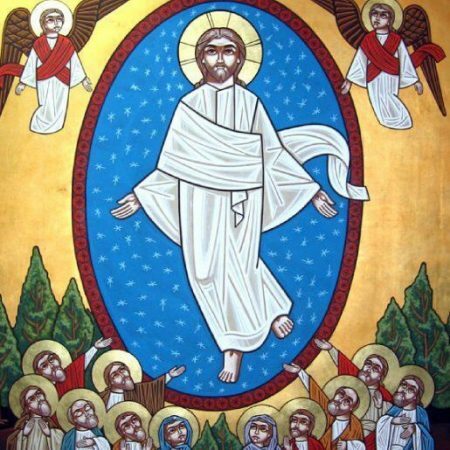 But as we stand here cleansed by the blood and peering through the clouds of incense as our risen Lord ascends the steps of the Temple once more, that is the challenge we hear from those two angels. “Why are you standing there staring? This whole world now is the mercy seat. Your ascended Lord has opened heaven to you, not that you might escape this world, but that you might follow him back into the world, from here to the ends of the earth, embodying that message of the utterly gratuitous forgiveness and love of God. James Alison in turn credits his thinking on these matters to the work of Margaret Barker, and especially her books The Great High Priest (London, T&T Clark, 2003) and Temple Themes in Christian Worship (London, T&T Clark, 2007).